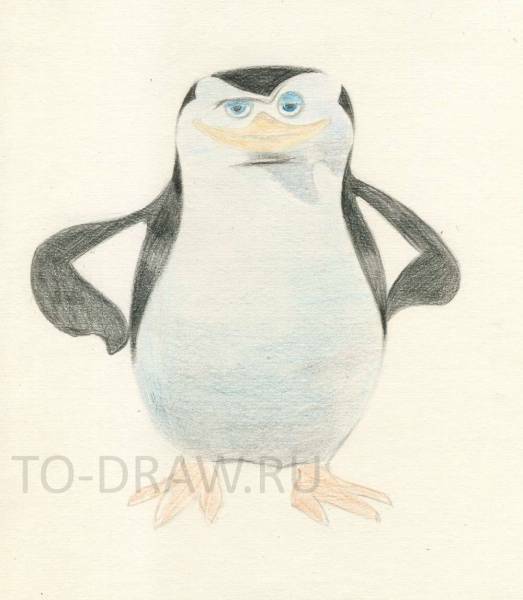 How to draw Penguins of Madagascar pencil stages? Drawing with colored pencils. 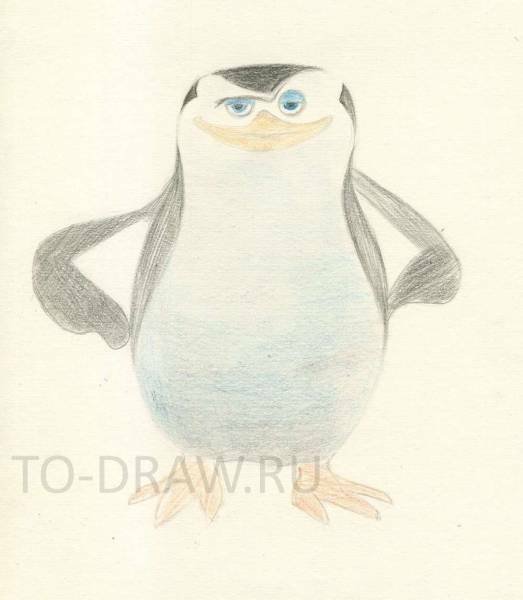 How to draw a penguin from Madagascar pencil in a few simple steps? Penguin pastel we are already painted, and now let's draw all the famous cartoon hero Skipper. The characters of these rich facial expressions and active gestures, so it is very useful to copy, trying to convey their emotions. The transcription is an essential step in learning. Copying, You are trying to understand the technique of this work, looking for their own style. So Srivijaya for your pleasure! So, today we draw the Skipper. 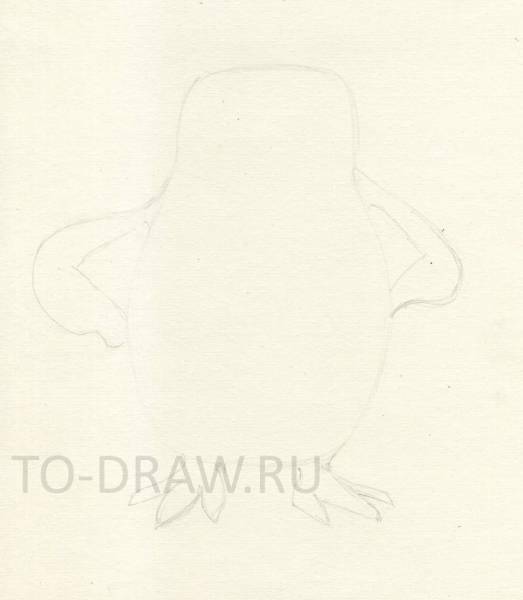 First light pencil lines make a sketch of our penguin. 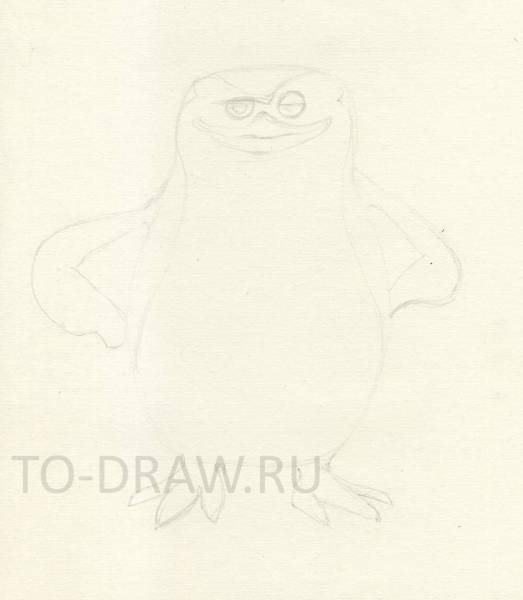 Unfortunately, the sketch I got very light and the scanner does not "read" all the lines. 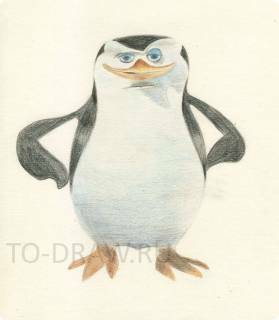 Penguin our egg with squadroni head. Hands-wings - side. Then the muzzle. Eyes round and half-closed eyelids. One eye, say, cringing. Beak close to the eyes and stretched almost the entire face. Add eyes and a beak. Begin to introduce color. Use black, grey and blue for abdomen. Ochre and shades of orange and brown for the beak and feet. Strengthen the contrast. Shaded denser lower part of the abdomen. Add a shadow under the beak - use this grey and blue. Some places use Indigo. Please note that we do not cover uniformly the same color, for example, wings and black barrel? and use multiple colors. If You look at the picture, do not forget to mention lighter where the light falls, place highlights and shadows. For shade, usually use more cool shades. In conclusion we will modify the beak - add red-brown at the base, and the tip of the beak will leave the light, thus we will achieve volume. Strengthen the contrast at the bottom of the abdomen and strengthen the shadow under the beak and around the eyes. Shade paws.